Louisville, KY, 2015-9-23 — /EPR Retail News/ — In October 1997, PepsiCo spun off its three restaurant brands – KFC, Pizza Hut and Taco Bell – to form a new company based out of Louisville, KY. 18 years later, Yum! Brands is one of the world’s largest restaurant companies with more than 41,000 restaurants in over 125 countries around the globe. We are a company with a Huge Heart and are proud to support the Louisville, KY community in the areas of hunger relief, arts and culture, human and social services. This year, we are celebrating our 18th anniversary on Friday, October 9th from 5:00 AM – 5:30 PM EST with a Redvs Blue Hunger “Drive-Thru” benefitting Dare to Care Food Bank. Bring at least 18 canned goods, in celebration of our 18th anniversary, and you will be entered into a drawing for either UK or UL basketball tickets. We will also be hosting Kentucky Sports Radio and the Afternoon Underdogs live on campus and will draw for the tickets on-air at Noon and 5:30 PM EST, respectively. 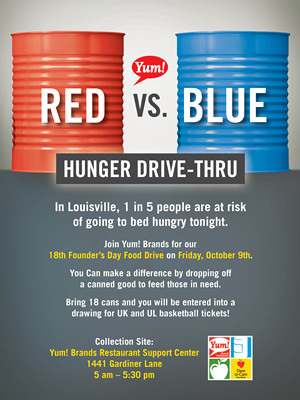 Former UK and UL athletes will be on-hand to help us greet the community and sort canned goods. The Hi-Five Donut truck will also be onsite serving up complimentary donuts between 10:00 AM – Noon. Join us Friday, October 9th to celebrate Yum! Brands’ 18th anniversary by helping us reach our goal of 18,000 cans for Dare to Care Food Bank. This entry was posted in Management, Philanthropy, Restaurants, Retail, Retailer and tagged Dare to Care Food Bank, KFC, Pizza Hut, Red vs Blue Hunger “Drive-Thru”, Taco Bell, Yum! Brands. Bookmark the permalink.